Due to the incessant rain, this meeting has sadly been postponed. Surprised there’s no comments, well done Ty! Track started with only one line on it and little passing, as meeting went on racing got better as the tractors and bowser did their job. Proctor was head and shoulders the stand out rider, although Matej Kus was a lot more keen on mixing / passing than normal and said he had been practicing on the track Tuesday. 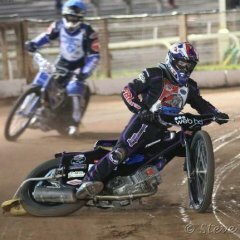 Jordan Stewart mentioned afterwards that he had been receiving help from Gary Havelock, Mason Campton ( mechanicing ) and hanging around with Ty Proctor--whatever you were doing Jordan keep doing it. Amongst the other riders Rafael Konopka and David Wallinger stood out for me 100% effort and commitment with Wallinger the only one to lead Ty at any time, the celebration of the heat win showed how much the meeting meant to him.